Post processing is without a doubt an unavoidable part of modern professional photography. And this cuts across the board – whether you’re dabbling in fashion photography or photojournalism, it is rare that a photo doesn’t need some tweaking in post, regardless how perfect the raw shot is. For this reason, the art of choosing the most suitable software to complement your photography cannot be overstated. In fact, it is almost as important as having the right lens and camera combination for a particular task. Adobe Lightroom ranks as one of the best catalog-based image editing applications you can get your hands on. Technically speaking, Lightroom is slightly different from its sibling, Photoshop. Also, besides being essentially a RAW converter, Lightroom is also considered to be the best professional post-processing tool for photography. In this article we will be looking at a workflow that you can use to import your photos correctly and keep them organized which will help to speed up your post-processing which is important once you start dealing with a lot of images and your collection grows over time. If you’re just getting started with Lightroom, it is important to come up with your own approach that works best for you, with that in mind here is a workflow framework that you a beginner can build on. As you may already know, Lightroom is essentially a catalog-based photo editing tool. This means a couple of things. For starters, this software tool does not work directly with your original files. Instead, it collects and stores relevant information about them in a set of files – known as a Catalog – along with their accompanying rendered previews. Secondly, to work with Lightroom, you have first to import or transfer them to the so-called Catalog. Launch Lightroom and proceed to select ‘Import.’ You can find this tab at the bottom left of the user interface when Library module. Alternatively, if you’re a Windows user, you can import files by using the shortcut “Ctrl+Shift+I” or selecting ‘Import Video and Photos…’ directly from the Module panel. The Import window will then pop up. Choose Source on the left hand side – Use this to pinpoint the location of those photographs you want to edit using Lightroom. Copy, Add, or Move / Copy as DNG – Using this function you can choose the way you want your files to be added to your new Lightroom Catalog. There is a caveat here; if you’re importing directly from an external flash disk or memory card, you won’t have the option of adding files to Catalog. You can, however, circumvent this by copying your photos to an external or internal hard drive. File Handling – For a beginner, a 1:1 preview is best desired. It is not only quicker for Lightroom to import your files while in this mode but also minimizes the potential loss of clarity and sharpness during the process. 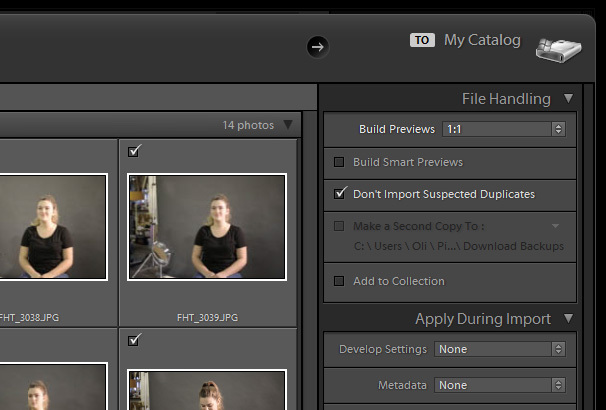 Speaking of time, you can significantly reduce the chances of importing duplicate images ( in case you have some in your source folder ) by checking the ‘Don’t Import Suspected Duplicates’ box. At this stage, you can also specify the destination of the ‘backup location’ if you’re getting your files from a flash drive or memory card. Rename your Files – This option is typically only available if you’re copying/moving images from an external location say a flash drive or memory card. In this case, you can either choose to use the available default renaming templates or come up with your own. Destination – In similar fashion, this option tab is available if you’re copying/moving images from an external location. So if you only want to add photos to Catalog, these settings are not applicable. Otherwise, the destination tab is used to specify the location you would want the files to be copied/moved during import. Apply During Import – You can specify the keywords here which makes locating to images via the filters in Library Module easier and more efficient ( if you ever need to ). 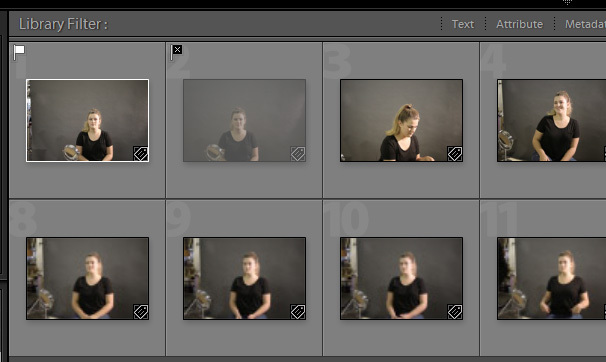 The Pick and Reject function is a good way of sorting out the images before you begin your post-process editing. Similarly, if there are any photos that you want to get rid off ( but somehow unsure ), use the Pick flag to mark those you like best and the Reject flag for those you dislike. Leave those that you’re unsure of as unmarked. You can later either edit or delete these manually after making up your mind. Remember that you can also do this in Library module ( while working with the largest thumbnails option ). There is denying that Collections are one of the best ways of organizing your unedited photos when working with Lightroom for streamlined access. And if you’re working with a mammoth number of files, this might just save you several hours that would otherwise be spent sorting haphazardly distributed photographs. It is more or less the way one creates access folders on their computer’s desktop area for convenient storage and access. The same way, you can create a Collection and later assign photos to it via ‘drag-and-drop’ technique. It works more like the ‘create shortcut’ function on your computer that doesn’t copy/move a file from its original location but only assigns it to a specified area. Consequently, you can assign an image to several Collections within Lightroom without necessarily copying or duplicating them. To make this a bit clearer, here is a classical example: Let’s say you have a particular Collection of portrait images and another different one for B&W files. You can fix a B&W portrait in both of these Lightroom Collections and edit/select the simultaneously – a crucial time-saving feature. Otherwise, it is advisable to create and put all images that you don’t like in one separate Collection. Apart from improving your organization, it allows you locate images that you can work with easily among the several thousand that may be in the current Catalog without stumbling on those that you don’t like. This way, you can also avoid accidentally deleting images from your current Catalog – a common scenario when working directly on the current Catalog. If anything, the storage hierarchy in Adobe Lightroom is such that removing an image from a particular Collection will only purge it from that Collection but not from the root Catalog. In light of the above argument, it is imperative to know how to create Collections the right way. To do this, start by clicking ‘+’ on the Collections main tab ( right-hand-side of the panel ). A menu pops up. Select ‘Create Collection’ then name it. Proceed to select those images that you would want to assign to that new Collection and drag-and-drop them there. Alternatively, you can select them before creating that Collection and use the ‘Include Selected Photos’ function in the course of setting up a Collection. Removing images/files from a Collection is just as easy. You can remove them from your Quick Collection by pressing ‘B’ the same way you did to add them. Bear in mind that images in Quick Collection have a gray dot when viewing them from the current Catalog. Which, of course, implies that temporarily assigning your pre-worked images to Quick Collection is another way of sorting them out before editing, converting them to B&W or performing a range of different actions to a group of several images at a go. Now that you have organized your work in Collections, the next logical step is post-processing your work to come up with the final images, you can apply your settings by hand or use a Lightroom Preset and tweak the results from there. Once you are happy with the look of your images you can export them. Exporting is as easy as importing. Right click on any file and select the ‘Export…’ option. A new window pops up presenting you with the following array of options and settings. Export Location – Use this to specify the file folder you would wish to store/save your images. File Naming – Select whether you wish to rename the final images or export them as they are with their original names. There a couple of naming presets you can use as far as this goes. File Settings – Specify the qualify and file format ( DNG, JPEG, TIF ) of the final exported images. Output Sharpening – This function is particularly useful when downsizing files on export or during print. It is a good way of applying extra sharpening when exporting images considering the likelihood of blurring during downsizing. Metadata – Use this function to specify the type and amount of metadata to be stored with a particular image as soon as it is exported. Image Sizing – Comes in handy when you want to resize your images when exporting them ( for instance, to a blog, site, drive, etc. ). As much as a basic workflow may not necessarily involve all of the above points, it is a good practice to learn how to build on some or all of these basics. That said, a bulk of some of these actions will just need to be done once or twice ( at most ). And a majority of these settings can be configured once only ( twice or thrice if you have to optimize an image differently ). This implies that most of the time you will be fiddling with importing images, assigning them keywords, sorting them out with the aid of flags and separating your color files from the B&W to facilitate quicker conversion. 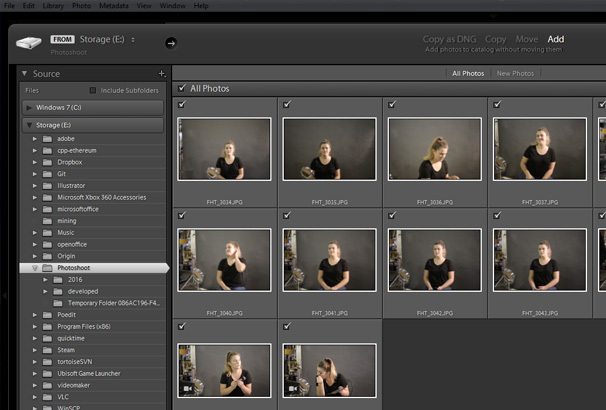 With such a simple but effective workflow, you can process your images quickly without leaving your Catalog in a mess. Truth be told, these are just the essentials of mastering Lightroom. More or less like Photoshop Lightroom 101; what you need to get started or post-process your first images correctly. A few factors will then dictate the approach that you settle for after this. Which, of course, include one’s personal preferences and the nature of images that you regularly work with. Like anything else exacting, filling the remaining gaps calls for dedicated effort and constant practice. Time takes care of the rest; before long you will have not only a unique workflow but also the right skillset on your fingertips.